Guy Gavriel Kay is one of the most consistently praised fantasy authors; for instance, Brandon Sanderson calls him the “the greatest living author of epic fantasy“. I had read the first Fionavar Tapestry book, The Summer Tree, but I didn’t understand what all the fuss was about – I thought it seemed like a cross between a more adult Narnia and The Wheel of Time (“Tapestry” instead of “Pattern”). I figured I should give him another shot though, and I’m glad I did, because now I understand, and only the pile of unread books in the house is keeping me from buying his entire bibliography right now. The Lions of Al-Rassan is set in the equivalent of the Iberian peninsula in the era of Moorish Spain. The Asharite city-states of the south and the Jaddite kingdoms of the north have had a tenuous peace despite their religious differences, but the winds are changing. Rodrigo Belmonte, the celebrated Jaddite captain, and Ammar ibn Khairan, the notorious right-hand man of the Asharite King Almalik of Cartada both find themselves driven away from their countries, and end up in the same city. Jehane, a Kindath physician, finds that her life is increasingly interwoven with theirs, as the world that she knows slowly begins to fall apart around her. 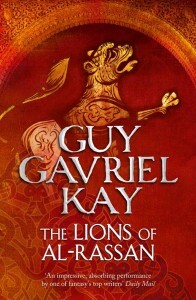 Despite being set in a secondary world, The Lions of Al-Rassan is clearly meant to evoke history – the names of the countries are different, and the religions are based on the celestial bodies of their world – but the map of the world is the same, and the Asharites, Jaddites, and Kindath represent the Muslims, Christians, and Jews, respectively. I wasn’t sure how I felt about that at first, but it’s a brilliant way for the author to take readers into how it felt like to live in that world without having to be too closely tied to historical accuracy. Rodrigo Belmonte and Ammar ibn Khairan are the heart and soul of this book. They’re from very different worlds, but have a lot in common – both are larger than life, principled, intelligent, compassionate – heroes that actually deserve their reputation. When they finally meet, the world itself shivers a little bit. We see their story play out from many points of view, but the most important (and third protagonist) is Jehane, who is exceptional in her own right, but not as relevant to history. These three break the barriers of faith and country to develop an enduring friendship, but even the greatest of men are just men, and cannot resist the inexorable pressure of history waiting to be made. The characterization of this book is exemplary – I’ve already talked about Rodrigo and Ammar a little bit, but Kay takes what would have been trite and cloying in less subtle hands and makes you truly believe in their legend. They’re not flawless – Rodrigo is somewhat reckless, and Ammar is a master of manipulation, but they still manage to make you believe in the ultimate goodness of humanity. I loved Jehane – the book blurb describes her as “increasingly torn by her feelings” which made me dread some sort of love triangle, but thankfully there’s none of that – she’s capable, intelligent, mature, and extremely skilled at what she does. I was pleasantly surprised to find that she’s also fully in control of her own sexuality. The supporting characters were fantastic, too – Alvar, one of Rodrigo’s young soldiers who gradually opens his eyes to the complexities of the world around him, and Rodrigo’s long-suffering, loving, and frankly, impressive wife Miranda were two of my favourites. One of the biggest themes in this book is conflicting loyalties – to king, country, church, and family/friends. Rodrigo and Ammar are exiled by their respective monarchs, but they still don’t lose their love for where they’re from. Alvar loves where he’s from, but when he realizes what the world is actually like, he makes very different choices from what he would have imagined when setting out as a young soldier. Ramiro’s wife, Ines, is loyal to her god and her church, but that is tested when it endangers her country. Even the Belmonte’s cleric, Ibero, makes a terrible choice, and ends up regretting it dearly. Many of the choices made could have almost gone the other way, and are sometimes influenced by almost-random events (like Ramiro’s decision after the meeting with his fellow Espereñan monarchs) and it ends up making the coming war and its effects seem even more tragic. Kay is an incredible writer – he uses the common themes of honor, loyalty, and sacrifice but elevates them to a whole different level – I thought I was beyond being moved by those things. He’s also tricky sometimes; there are several scenes in which you think you know exactly what’s going on but his cunning phrases and slight omissions mean that what actually happens is a complete surprise. The scene at the end of the Carnival in Ragosa, and the epilogue are two examples. I don’t think I could read his books all in a row if they’re all this intense, but I’m so glad I have them to look forward to. I could keep going on, but I don’t think I could convey any better how amazing The Lions of Al-Rassan is, so I’ll stop here. I highly recommend it, I think it’s one of the masterpieces of fantasy. This entry was posted in Books, Reviews and tagged fantasy, fiction, history by Kriti Godey. Bookmark the permalink.